I have a small home office where I do my writing and pay my bills. It was converted from a guest bedroom to a convenient workspace. And now in a flash, it transforms from office to workout room. Great for days when going elsewhere is inconvenient. 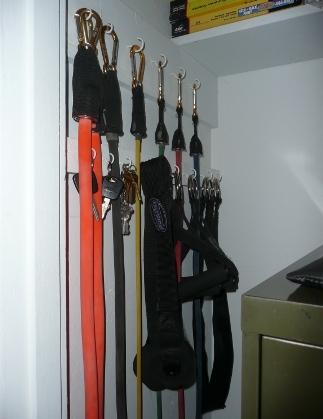 Hung neatly in the storage closet and next to a metal filing cabinet are sets of resistance bands and a rolled up yoga mat. Actual required time for office to exercise room conversion: less than one minute. Short of illness, there’s never an excuse for missing a workout. As I’ve gotten older, I use it more and more and going somewhere else to exercise less and less. Some kettlebells, too, sit beneath a nearby desk. I like kettlebells. But resistance bands these days play the greatest role. Don’t give up your gym membership if you enjoy the camaraderie in a gym and the widely varied equipment and programs. I’ve belonged to gyms for years. I know what they offer. On the other hand, in the time it takes just to drive to a gym, I can be halfway through my workout at home. It’s exercise, take a shower and I’m done. No traffic. No hassle. Okay. So you may be thinking that’s all well and good. But are those resistance bands really that effective? Without hesitation, I can say that they are. I’m certainly not running down free weights. But as I’ve gotten older the resistance bands seem to be a better fit. Now let me acknowledge that there are some people who simply won’t exercise at all unless in a class or gym setting. For them, home workouts without a trainer present just won’t work. For others, resistance bands may be a great training option. Around $50 to $100 and you can have a total home workout system. Bands are also compact and can go with you when you travel. My wife and I went away for a few days not long ago and I brought along the bands in a small (13 x 13 inch) satchel that came with the set. I never missed a workout. Another huge plus is that I have never — and I mean never — developed any tendinitis while using resistance bands. Does that mean it can’t happen? Of course not. It’s possible to develop tendinitis using any kind of exercise equipment, or even bodyweight exercises alone. But exercise bands are easier on aging tendons and ligaments than weights, no question about it. 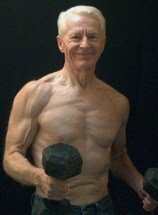 Exercising muscle without beating-up one’s joints becomes increasingly more important as we grow older. So let's say you’ve been working-out across town at the “Big Iron” gym. You’re a senior but still able to keep pace, of close to it, with the young guys and gals. Maybe you think that resistance bands are kind of wimpy. (You’ve seen those skinny little elastic bands lying around the aerobics room.) Don’t be fooled. The bands I’m talking about are the kind some professional football teams use. There are plenty of companies selling them. Mine are from BodyLastics and purchased through Amazon (I receive no compensation from the company if people buy them). Complete sets come with easy level bands to strongman thickness and various levels in between.